THE RENAISSANCE was the golden age of European history where humanistic studies, engineering development, scientific inventions and artistic achievements all happened almost at once. It produced men like Leonardo da Vinci, Michelangelo and Niccolo Machiavelli who were equally competent as artists, civil engineers, scientists, diplomats, social commentators, poets and scholars. Chief in that stellar group was Lorenzo the Magnificent, head of the Medici banking family and unofficial head of the government of Florence. He was also an enthusiastic patron of scholars, artists, architects and musicians. When Michelangelo was a boy, Lorenzo recognised his genius, and supported him financially for four years. “As soon as Lorenzo had gone away, Michelangelo broke off one of the faun’s teeth and dug into the gum so that it looked as if the tooth had fallen out; and he waited anxiously for Lorenzo to come back. After he had seen the result of Michelangelo’s simplicity and skill, Lorenzo laughed at the incident more than once and used to tell it to his friends. He resolved that he would help and favour the young Michelangelo; and first he sent for his father, Lodovico, and asked whether he could have the boy, adding that he wanted to keep him as one of his own sons. “He wrote devotional poems, as his mother had done, and blasphemous parodies which would have distressed her; he wrote hunting songs and love songs, exuberant canzoni a ballo, carefree burlesques and libidinous canti carnascialeschi, like the Song of the Fir Cone Sellers, celebrating the delights of sexual passion and physical love. “Above all, his feeling for the beauty of the Tuscan landscape, and for the pleasures and hardships of the life of country people, is expressed with an extraordinarily vivid intensity. 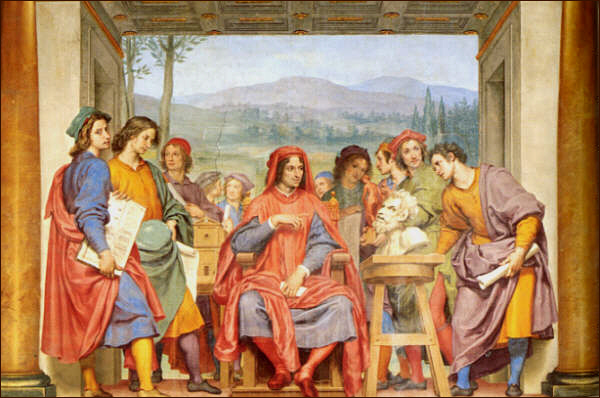 Lorenzo believed strongly in learning and funded generously the Universities of Pisa and Florence. He died on April 8, 1492. He was only 43. In his last few years he suffered badly from gout, like Henry VIII of England and many other prominent men of the Renaissance. Gout, pain and premature dying were a small price to pay for the good food, good wine and other indulgences of life.